U.S. oil production averaged 7.5 million barrels per day (bpd) in 2013, reaching the highest levels since 1989, according to new data from the Energy Information Administration (EIA). Domestic oil production hit 7.9 million bpd in December 2013, an 11 percent increase compared to December 2012. 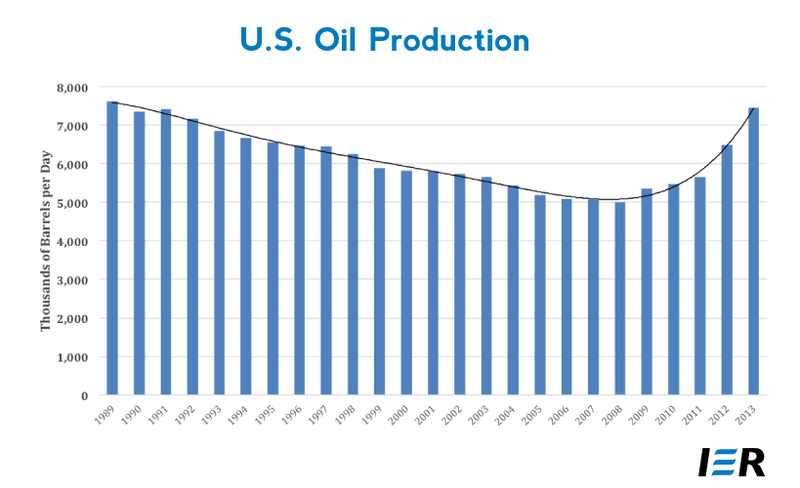 The following chart shows U.S. oil production between 1989 and 2013. Meanwhile, on the federal OCS, production again went down. Domestic oil output rose by 966,000 bpd—15 percent—between 2012 and 2013, the largest annual percentage increase since 1940. Texas and North Dakota drove the boom, accounting for 83 percent of U.S. production growth since 2000. In December 2013, the Eagle Ford shale formation in Texas produced 1.22 million bpd, while the Bakken shale formation in North Dakota eclipsed 1 million bpd, according to EIA’s Drilling Productivity Report. Thanks to the shale boom on state and private lands, America is now rapidly displacing imported oil with domestic production. Oil imports fell to their lowest levels since 1996 and 30 percent below the June 2005 peak of 10.7 million bpd, according to EIA. Domestic oil production now supplies 49 percent of U.S. oil demand, up from 43 percent in 2012. EIA offers a bullish forecast for future growth in domestic oil production. EIA’s latest Drilling Productivity Report predicts combined oil production in key regions (Bakken, Eagle Ford, Haynesville, Marcellus, Niobrara, and Permian) to increase by a combined 67,000 bpd in April. EIA expects the Bakken to hit nearly 1.1 million bpd in April and the Eagle Ford to eclipse 1.35 million bpd. America’s domestic energy boom is made possible by recent technological advancements that combine hydraulic fracturing and horizontal drilling to access previously inaccessible oil trapped in dense shale rock formations. This boom, however, is occurring almost entirely on state and private lands on which the federal government has little control. On lands owned by the federal government, domestic energy production has actually fallen by 15 percent over the last two years. America is becoming more energy secure despite federal policies that restrict access to the country’s vast energy resources. Americans are left to wonder how much more oil we could produce if not for federal policies designed to obstruct domestic energy development.